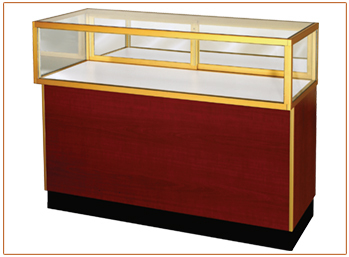 Retail jewelry stores showcase their jewelry collections in these retail display cases. The glass display box is right on top so it gives your customers a great view of your products. Many great showcase options available for our display cases, including custom HPL colors, LED showcase lighting, showcase storage and more. The overall dimensions of a Streamline Jewelry showcase are 38” high and 20” deep, with 4 different lengths available. The glass case is 12” high and 20” deep. The recessed wood base is 22” high and 17.5” deep. The base on a standard case is open on the clerk side with one row of adjustable wood shelving in the storage area. The black kick base is 4” high. Jewelry display cases do not have glass shelves in the display area.